The Lego Movie 2: The Second Part (released in some markets as The Lego Movie 2) is a 2019 computer-animated adventure comedy film produced by the Warner Animation Group and distributed by Warner Bros. Pictures. A direct sequel to The Lego Movie (2014), it is the fourth film in the franchise, following the release of two spin-offs, The Lego Batman Movie and The Lego Ninjago Movie (both 2017). Animal Logic, who provided the animation for all the films in the franchise, returned. The film is directed by Mike Mitchell, with Phil Lord and Christopher Miller (writers and directors of the first film) returning as producers and writers; animation direction is by Trisha Gum. It features Chris Pratt, Elizabeth Banks, Will Arnett, Charlie Day, Alison Brie, Nick Offerman, and Will Ferrell reprising their roles from the previous film, along with new additions to the cast including Tiffany Haddish, Stephanie Beatriz, and Maya Rudolph. The Lego Movie 2: The Second Part (released in some markets as The Lego Movie 2) is a 2019 computer-animated adventure comedy film produced by the Warner Animation Group and distributed by Warner Bros. Pictures. A direct sequel to The Lego Movie (2014), it is the fourth film in the franchise, following the release of two spin-offs, The Lego Batman Movie and The Lego Ninjago Movie (both 2017). Animal Logic, who provided the animation for all the films in the franchise, returned. The film is directed by Mike Mitchell, with Phil Lord and Christopher Miller (writers and directors of the first film) returning as producers and writers; animation direction is by Trisha Gum. It features Chris Pratt, Elizabeth Banks, Will Arnett, Charlie Day, Alison Brie, Nick Offerman, and Will Ferrell reprising their roles from the previous film, along with new additions to the cast including Tiffany Haddish, Stephanie Beatriz, and Maya Rudolph. The Lego Movie 2: The Second Part was released in the United States and United Kingdom on February 8, 2019, in 2D, 3D, RealD 3D, Dolby Cinema, IMAX, and IMAX 3D formats. The film has grossed over $136 million worldwide against a budget of $99 million and received positive reviews from critics, who commended its humor, screenplay, animation, soundtrack, visuals, and voice acting, although some said it was not as "fresh" as the first film. The movie begins where it left off, with the Duplo invaders coming to Bricksburg. Emmett opts to approach them peacefully, building a heart out of LEGO's as a token of friendship. They seem to like it, but when one of them eats it and playfully demands more, Lucy interprets this as an attack and retaliates. This causes the Duplo creatures to cry and more soon come, making a mess of Bricksburg, but Emmett tells Lucy that "Everything can still be awesome." The Duplo army leader General Sweet Mayhem arrives in Apocalypseburg, and proclaims that Queen Watevra Wa'Nabi of the Systar System wants to marry their leader. After some debate over who the leader is, Mayhem's forces kidnap Batman, Lucy, Benny, MetalBeard, and Unikitty, taking them to the Systar system. Batman is taken to Wa'Nabi and eventually agrees to marry her, while the others are placed in environments designed to tempt them, which only Lucy resists. Meanwhile, Emmet converts his dream house to a spaceship to give pursuit. He travels through "the Stairgate" (out of the basement) and en route, he is saved from colliding with an asteroid field by the rugged adventurer Rex Dangervest. As they travel to the Systar system, Emmet begins to absorb several of Rex's mannerisms and hopes to impress Lucy with his hardened attitude. The two evade capture by Wa'Nabi's forces and join with Lucy. Emmet devises a plan to rescue his friends, which involves Lucy switching off the pop music that's supposedly brainwashing the others and Emmet destroying the reception cake encased in a temple to stop the wedding. As Lucy fights Mayhem to get to the music she learns that the Systar System never intended to be antagonistic towards Apocalypseburg, but instead sought peace between them and simply failed at communicating so. In addition she discovers that Queen Watevra Wa-Nabi's original form was the heart that Emmet built for the Duplo Aliens in his attempt to create peace. Emmet, facilitated by Rex's manipulations, destroys the temple just as Lucy realizes that Rex actually intends to bring upon the Armamageddon deliberately. In the real world, the act of destroying the temple is represented by Finn angrily destroying Bianca's LEGO creations. Hearing them bicker, their mother gets furious and orders them to put their LEGO sets into storage, this event being the Armamageddon (as in "Our Mama Gets In"). Emmet tries to stop them but is stopped by Rex, who reveals he is an embittered version of himself from the future. After being neglected for years underneath the dryer after crashing in the asteroid field, he time-traveled back with the intention of causing the Armamageddon as revenge. Rex knocks Emmet under the same dryer to ensure his existence, but Lucy rallies the others into escaping from the storage bin (bringing them back into the LEGO world), and rescues Emmet from Rex. Emmet and Lucy overpower Rex and destroy his time machine. Rex turns redemptive but declares "no regrets" as he and his timeline are erased from existence. Wa'Nabi and Batman finally wed, represented by Finn and Bianca reconciling with each other and agreeing to play together again. Their mother returns their LEGO sets, averting Armamageddon. The LEGO universe is transformed into a mishmash of Apocalypseburg and the Systar System called "Syspocalypsestar" which is a peaceful place. Emmet's dream house is rebuilt and Lucy reveals that she was one of the original artists of "Everything Is Awesome" much to Emmet's surprise. Rex Dangervest, a self-declared galaxy-defending archaeologist, cowboy and raptor trainer. The character is an amalgamation of other roles played by Pratt including Star-Lord from the Marvel Cinematic Universe, Owen Grady from Jurassic World, Scott Hatteberg in Moneyball, Burt Macklin from Parks and Recreation and Joshua Faraday from the 2016 remake of The Magnificent Seven, and also a reference to rumors that Pratt would play Indiana Jones. He is later revealed to be Emmet's future self, after travelling back in time with the help of stolen technology from Doctor Who, Back to the Future, The Terminator and Hot Tub Time Machine, among others. Tiffany Haddish as Queen Watevra Wa'Nabi, the shape-shifting alien queen of the Systar System. Stephanie Beatriz as General Sweet Mayhem, an intergalactic mini-doll who is general of the Systar System Army and works under the orders of Queen Watevra Wa'Nabi. Charlie Day as Benny, a Master Builder who is a spaceship-obsessed 1980's spaceman. In this film, he has a metallic arm. Alison Brie as Princess Unikitty, a Master Builder who is a unicorn-horned cat. In this film, instead of turning red when angry, she is red altogether. Over the years since the first film, she has developed the ability to become a giant robotic version of herself called Ultrakatty when a battle is about to occur. Nick Offerman as MetalBeard, a Master Builder who is a large bionic robot pirate with a severed head after he lost his original body in an earlier encounter with Lord Business' forces. Brooklynn Prince as Bianca, Finn's younger sister, who is the reason why the aliens from the planet Duplo attacked Bricksburg. Mom, the unnamed mother of Finn and Bianca in the real world. In the LEGO universe, she’s the bringer of "Our-Mom-Ageddon". She was previously voiced by Amanda Farinos in the first film. Dorothy Gale, the main character of The Wonderful Wizard of Oz. President Business / Lord Business, the former President of the Octan corporation and the LEGO World who previously served as the main antagonist of the first film. The Man Upstairs, Finn & Bianca’s father. Outside of re-used footage from the first movie, Ferrell does not appear on-screen in this role, performing only an off-screen voiceover. Richard Ayoade as Ice Cream Cone, a talking ice cream cone who is a citizen of the Systar System. Arturo Castro was originally set to voice the character, but Ayoade took over the role for unknown reasons. Jonah Hill as Green Lantern, a DC Comics superhero who is one of the Master Builders. Ralph Fiennes as Alfred Pennyworth, a DC Comics character and Master Builder who is Batman's loyal butler. Fiennes reprises his role from The Lego Batman Movie. Noel Fielding as Balthazar, a sparkly vampire describing himself as an "attractive and non-threatening teen vampire" who is a citizen and the spa expert/DJ of the Systar System. He is a nod to Edward Cullen from The Twilight Saga. On February 3, 2014, Jared Stern was hired to write the sequel, along with Michelle Morgan. On March 12, 2014, Deadline reported that animation co-director Chris McKay would direct the sequel with Phil Lord and Christopher Miller as producers. On April 10, 2014, it was reported that McKay wanted to have more women in the sequel than men. On July 28, 2014, it was reported that Chris Pratt wants to return to reprise his role as Emmet. It was also reported that Will Arnett might return to reprise his role as Batman, but had not decided yet. In October 2014, Warner Bros. scheduled The Lego Batman Movie for 2017, and The Lego Movie 2 for May 25, 2018. On October 25, 2014, it was reported that Lord and Miller had signed on to write The Lego Movie 2. On October 30, it was announced that Australia-based animation studio Animal Logic was in talks to produce the next three Lego films (though the deal was not finalized at the time) and the New South Wales government would make financial contributions to all the films. On November 12, during an interview with BBC News, Lord and Miller revealed that there would be more female characters featured in the film. On February 24, 2015, the sequel was titled The Lego Movie Sequel and Rob Schrab was announced as the film's director, replacing McKay as director as he was scheduled to direct The Lego Batman Movie instead. By November 2015, Miller announced that the first draft of the script was completed. Subsequent rewrites were provided by Raphael Bob-Waksberg, Dominic Russo and Matthew Fogel. By February 2017, Schrab had been replaced by Mike Mitchell, reportedly due to "creative differences". Production started in Canada on October 2, 2017. In an interview with Collider, producer Dan Lin confirmed that Lord & Miller were rewriting the script during production. The film is dedicated to Charie Miller, Christopher Miller's mother, who died on December 27th 2018, before the film was released. The Lego Movie 2's narrative starts after the events of the first film, just as Finn's toddler sister Bianca starts to play with Duplo blocks and tries to take over Bricksburg. In the intervening years, Bianca has taken more of the Lego sets to incorporate into her own creations. The animation team recognized that girls would likely not only use Lego bricks but also incorporate other materials, such as fabrics and paper, creating a challenge for their rendering team. They wanted these elements to appear as if a child was manipulating them through their stop-motion animation process. They explored multiple design styles for each playset that is within Bianca's room, the "Systar System", and developed new animation approaches for some of these styles, including using fewer frames as in inbetweening. They also incorporated the Lego Friends line of toys aimed at girls, which include mini-dolls like General Sweet Mayhem. However, unlike traditional Lego mini-figurines, the Lego Friends' mini-dolls do not have the same articulation, for example, having no separate leg movement or wrists that rotate. The production team, working with Lego, did not want to create walking and movement patterns that did not match the articulation the real figurines could do, and came up with creative solutions for animating these in the film. This also created a challenge for at least one song and dance number; production brought in a choreographing team to help plan out the dance taking into account for the restrictions of movement for the mini-figures. For Queen Watevra Wa-Nabi, the production team decided to simply assign a pile of random Lego bricks for her, but required that each of the forms that she could shape-shift into used only those bricks from that pile. Among a concern between the creative leads was how to represent the Lego universe. Miller stated that they see each of the Lego films taking place in the mind of a child, with both The Lego Movie and The Lego Batman Movie occurring within Finn's mind. With The Lego Movie 2, both Finn and Bianca's imaginations drive events, and the creators opted to leave parts of the film vague if the scene was based on Finn's version, Bianca's version or some combination. However, in some scenes they wanted to be clear it was Finn or Bianca's view influencing the events, and thus provided clues such as the type of dialogue given by the main characters to figure out whose imagination was at work. Among the mini-figures within the film will be one based on Supreme Court Justice Ruth Bader Ginsburg. Lord and Miller had considered figures that would be unexpected within the film, with Ginsburg as one of their ideas. They received Ginsburg's blessing for this appearance, though she did not perform any voice work for this role. Subsequently, the Ginsburg mini-figure will be made as part of the movie's toy line. On March 23, 2018, it was reported that Tiffany Haddish had been cast in the film to voice a new lead character, while returning actors would be Chris Pratt as Emmet, Elizabeth Banks as Wyldstyle, Will Arnett as Batman, Channing Tatum as Superman, and Jonah Hill as Green Lantern. Stephanie Beatriz and Arturo Castro were announced to be part of the film on June 4, 2018. Castro was replaced by Richard Ayoade in the final film. During San Diego Comic Con 2018, it was announced that Pratt would also voice a new character in addition to Emmet, Rex Dangervest, who is based after Pratt himself. In November 2018, Maya Rudolph joined the cast. In early January 2019, it was revealed that Jason Momoa would reprise his role as Aquaman from the DC Extended Universe. Gal Gadot was to also reprise her role as Wonder Woman from the DC Extended Universe, replacing Cobie Smulders from the previous film, but Smulders ended up returning shortly before the film's release. Daniel Radcliffe was originally set to voice a look-like of his Harry Potter known as Larry Potter, but his scene was ultimately cut. It was revealed by Mike Mitchell that Radcliffe's cameo was deleted due to not wanting to risk anything that would upset the Harry Potter fandom. The character was replaced by Larry Poppins (another look-alike character based on a British media icon). Following the same attempt to create an earworm with the first film's "Everything Is Awesome", the producers of the film created a similar song for the sequel, called "Catchy Song", which principally features as its only lyric the repeated phrase "This song's gonna get stuck inside your head". The song was written by Jon Lajoie, produced by Dillon Francis, and sung by T-Pain and That Girl Lay Lay. According to Lajoie, he found that "Everything is Awesome" was "annoyingly catchy", and the only way that they could outdo that was "Dial the 'annoying' up to 11!". Mark Mothersbaugh, who composed the first film's soundtrack, as well as the score for The Lego Ninjago Movie, returned to compose the score for the sequel. The film was theatrically released in the United States and the United Kingdom on February 8, 2019. The film was released one day earlier in Denmark. This was its third rescheduling; it was first scheduled to be released in the US on May 26, 2017 and then on May 18, 2018. On January 24, 2019, Warner Bros. announced it would hold one-day previews for the film in 500 theaters in the United States, two days later. On June 4, 2018, the first poster was released along with an announcement that the first trailer would be released the following day. The second trailer was released on November 20, 2018, along with the second poster. On Black Friday 2018, Warner Bros. released The Lego Movie on YouTube in its entirety for one day only, with a trailer for The Lego Movie 2: The Second Part attached. The third and final trailer was released on December 19, 2018. In the UK, DFS Furniture ran a marketing campaign that tied in with The Lego Movie 2. Other brands that partnered with the film include Chevrolet for promoting the Silverado, Chiquita, McDonald's for Happy Meal toys, Discover card, and Turkish Airlines. Just like the first film, Lego released a toyline theme of over 20 sets based on scenes from the film, including collectable Minifigures. 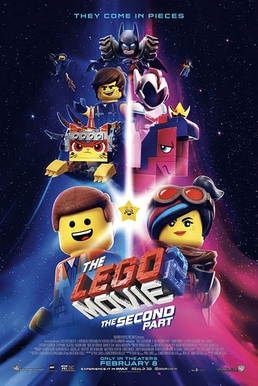 A video game based on the film, The Lego Movie 2 Videogame, a direct sequel to The Lego Movie Videogame, was announced on November 27, 2018 and is scheduled to be released on February 26, 2019, two weeks after the film's release, for Microsoft Windows, PlayStation 4 and Xbox One, and for the Nintendo Switch on March 26. On August 1, 2018, Turkish Airlines and Warner Bros. released a special safety video featuring characters from the franchise. On December 10, 2018, Warner Bros. released a short film, titled Emmet's Holiday Party, as a Christmas styled promotion for the film. On January 8, 2019, one month before the film's release, Lego released a music video titled "Everything is Awesome" Dance Together Music Video, on its official YouTube Channel. The video uses the titular song. From January 5 to January 26, 2019, the Lego channel made a series of short films, Saving Bricksburg, in which characters from the film were shown in short reenactments of The Lego Movie. As of February 24, 2019[update], The Lego Movie 2: The Second Part has grossed $83.6 million in the United States and Canada, and $53 million in other territories, for a total worldwide gross of $136.6 million. In the United States and Canada, The Lego Movie 2 was released alongside What Men Want, Cold Pursuit and The Prodigy, and was originally projected to gross $50–55 million from 4,303 theaters in its opening weekend. The film made $1.5 million from Thursday night previews, and when combined with advance screenings held at 550 theaters on January 26, 2019, made a total preview gross of $2.1 million. After making just $8.5 million on its first day, weekend estimates were lowered to $31 million. It went on to debut to $34.1 million, finishing first at the box office but marking a 50% decline from the first film. Deadline Hollywood attribute the low opening to franchise fatigue due to the release of two spin-offs prior to The Lego Movie 2, as well as Warner Bros. promoting the film using similar marketing tactics from the first film, leading audiences assuming the sequel derivative and indistinguishable from its predecessor. On Rotten Tomatoes, the film holds an approval rating of 86% based on 234 reviews, with an average rating of 7/10. The website's critical consensus reads, "While it isn't quite as much fun as its predecessor, The LEGO Movie 2: The Second Part fits neatly into an animated all-ages franchise with heart and humor to spare." On Metacritic, the film has a weighted average score of 65 out of 100, based on 50 critics, indicating "generally favorable reviews". Audiences polled by CinemaScore gave the film an average grade of "A–" on an A+ to F scale (down from the first film's "A"), while those at PostTrak gave it an average 4 out of 5 stars; social media monitor RelishMix noted online responses to the film were "great". Jesse Hassenger of The A.V. Club called the film "lovable", giving it a grade of B and writing "Like Brad Bird's recent Incredibles 2, it follows up a dazzling animated original (all the more dazzling for earning that designation despite being based on a toy line) with some big ideas that don’t cohere with the same streamlined magic as its predecessor." TheWrap's Yolanda Machado commended the screenplay and directing and wrote that the film "expands on the original's premise, adding new worlds and characters to the growing LEGO universe, while also crafting a story that is timely, inventive, hilarious and perfect for all ages." Chris Nashawaty of Entertainment Weekly says that while it was better than most other films it didn't recapture the surprise of the first film, saying "Everything is still awesome. Just a little bit less so." For The Hollywood Reporter, Michael Rechtshaffen wrote that the film brought "little that's fresh or funny to the interlocking brick table despite boasting a script penned by originators Phil Lord and Christopher Miller." 1 2 3 4 "Film releases". Variety Insight. Archived from the original on September 29, 2018. Retrieved November 20, 2018. ↑ "THE LEGO MOVIE 2 - British Board of Film Classification". www.bbfc.co.uk. ↑ Faughnder, Ryan (February 7, 2019). "'Lego Movie' sequel and 'What Men Want' to boost box office after Super Bowl doldrums". Los Angeles Times. Retrieved February 7, 2019. ↑ "The Lego Movie 2: The Second Part (2019)". The Numbers. Retrieved February 20, 2019. 1 2 "The Lego Movie 2: The Second Part (2019)". Box Office Mojo. Retrieved February 24, 2019. 1 2 Kit, Borys; Galuppo, Mia (February 3, 2017). "'Lego Movie' Sequel Enlists 'Trolls' Director Mike Mitchell (Exclusive)". The Hollywood Reporter. Retrieved February 3, 2017. ↑ Flores, Terry (May 8, 2018). "10 Animators to Watch". Variety. Retrieved June 4, 2018. ↑ Ridgley, Charlie (January 28, 2019). "'The LEGO Movie 2: The Second Part' Review Round-Up". ComicBook.com. Retrieved February 11, 2019. 1 2 3 Bibbiani, William (January 23, 2019). "The Lego Movie 2: Phil Lord And Chris Miller Explain Their Meta Universe". IGN. Retrieved January 23, 2019. 1 2 3 4 5 6 7 8 Kit, Borys (March 23, 2018). "Tiffany Haddish to Voice-Star in 'Lego Movie 2'". The Hollywood Reporter. Retrieved March 24, 2018. 1 2 "'The LEGO Movie 2' Features Chris Pratt in Two Roles and Tiffany Haddish as a Shapeshifting Alien [Comic-Con 2018]". July 21, 2018. 1 2 3 D'Alessandro, Anthony (June 4, 2018). "'Lego Movie 2' Adds Stephanie Beatriz & Arturo Castro; Alison Brie & Nick Offerman Confirmed To Return". ↑ "The LEGO Movie 2 Trailer is Here!". June 5, 2018. ↑ Hannett, Michelle (November 20, 2018). "The Gang Is Back in New Poster And Trailer For THE LEGO MOVIE 2". WeAreMovieGeeks. Retrieved January 1, 2019. 1 2 3 McLean, Tom (January 4, 2019). "'The LEGO Movie 2': Playing Outside the Box". Animation Magazine. Retrieved January 23, 2019. 1 2 "Weary of Black Friday? Enjoy 'Brick' Friday with a First-Time-Ever Free YouTube Showing of "The LEGO® Movie" and Catch the Trailer for Its Hotly Anticipated Sequel" (Press release). Warner Bros – via BusinessWire.com. ↑ Gemmill, Allie (January 23, 2019). "LEGO Movie 2 Getting Early Screenings Two Weeks Before Release". Screen Rant. 1 2 3 Florio, Angelica (February 7, 2019). "'The Lego Movie 2' Voice Cast Is Stacked With Stars, Including Tiffany Haddish As A Shape-Shifting Unicorn". Bustle. ↑ "Jason Momoa's Aquaman joins The LEGO Movie 2: The Second Part". Flickering Myth. December 28, 2018. ↑ Richard Roeper (2019-01-28). "'The Lego Movie 2' pieces together pop culture, pop music into another winner". Chicago Sun Times. ↑ Barsanti, Chris (January 29, 2019). "Review: The Lego Movie 2: The Second Part Is So Not Awesome". Slant Magazine. ↑ Coulston, John Connor (January 26, 2019). "'The Lego Movie 2' Features Secret Cameo From an A-List Action Star". PopCulture.com. ↑ "See Noel Fielding and Richard Ayoade in the Lego Movie 2". Chortle. ↑ Shaw, Lucas (February 3, 2014). "Warner Bros. Already Working on Sequel to 'The Lego Movie' (Exclusive)". The Wrap. Archived from the original on March 5, 2014. Retrieved April 14, 2016. ↑ "Warner Bros Builds LEGO Sequel With Chris McKay Directing". Deadline Hollywood. March 12, 2014. Archived from the original on March 13, 2014. Retrieved April 14, 2016. ↑ "Lego Movie Sequel Director Regretful Original Film Fails | Women and Hollywood". Indiewire. April 11, 2014. Archived from the original on April 13, 2014. Retrieved April 14, 2016. ↑ "Chris Pratt: 'I'd love to return for Lego Movie sequel'". Digital Spy. July 28, 2014. Archived from the original on August 16, 2014. Retrieved April 14, 2016. ↑ Kroll, Justin (October 15, 2014). "WB Announces 10 DC Comics Movies, 3 'Harry Potter' Spinoffs and 'Lego' Sequels". Variety. Archived from the original on October 15, 2014. Retrieved April 14, 2016. ↑ "Warner Bros. DC Comics Movie Slate Fully Revealed!". ComingSoon.net. Archived from the original on October 17, 2014. Retrieved April 14, 2016. ↑ Fleming Jr., Mike (October 25, 2014). "'Lego Movie' Sequel Gets Phil Lord, Chris Miller Script Commitment". Deadline Hollywood. Retrieved April 14, 2016. ↑ Frater, Patrick (October 30, 2014). "Australia's Animal Logic Poised to Produce Next Three 'Lego' Movies". Variety. Retrieved April 14, 2016. ↑ Masters, Tim (November 12, 2014). "Lego Movie 2 'will feature more female characters'". BBC. Retrieved April 14, 2016. ↑ Kit, Borys (February 24, 2015). "'Lego Movie' Sequel Lands 'Community' Director". The Hollywood Reporter. Retrieved April 14, 2016. ↑ Romano, Nick (November 28, 2015). "Lego Movie 2: Phil Lord, Chris Miller Script Just Turned In For Sequel". Entertainment Weekly. Retrieved January 20, 2019. ↑ Kroll, Justin (July 7, 2016). "Lego Movie Sequel Getting Rewrite From BoJack Horseman Creator (EXCLUSIVE)". Variety Magazine. Retrieved January 20, 2019. ↑ Weisis, Josh (November 20, 2018). "Go Where No Brick Has Gone Before in the New Trailer For The Lego Movie 2: The Second Part". SYFYWire. Retrieved January 20, 2019. ↑ Kit, Borys; Galuppo, Mia (February 3, 2017). "Lego Movie Sequel Enlists 'Trolls' Director Mike Mitchell (Exclusive)". The Hollywood Reporter. Retrieved January 20, 2019. ↑ "LEGO Movie 2 begins production in October". moviehole.net. ↑ "Production about to begin on The LEGO Movie Sequel". brickfanatics.com. ↑ Goldberg, Matt (September 14, 2017). "Exclusive: The LEGO Movie 2 to Tackle Gender Differences; Lord & Miller Rewriting the Script". Collider. Retrieved January 20, 2019. ↑ Alexander, Bryan (January 19, 2019). "Supreme reveal: Ruth Bader Ginsburg makes star appearance in 'Lego Movie 2'". USA Today. Retrieved January 19, 2019. ↑ "Ruth Bader Ginsburg to have cameo in The Lego Movie 2". BBC. January 21, 2019. Retrieved January 21, 2019. ↑ Chichizola, Corey (Feb 1, 2019). "Why Daniel Radcliffe's Lego Movie 2 Cameo Got Cut". CinemaBlend. ↑ Alexander, Bryan (January 18, 2019). "'Lego Movie 2' director apologizes to parents for 'Catchy Song' and future of repeat plays". USA Today. Retrieved January 21, 2019. ↑ Jirak, Jamie (January 19, 2019). "'The LEGO Movie 2: The Second Part' Teases The Song That Will Get Stuck Inside Your Head". Comicbook.com. Retrieved January 22, 2019. ↑ UK, The LEGO Movie 2 (January 9, 2019). "The new #TheLEGOMovie2 poster is out of this world…literally, as Emmet and the gang venture to the Systar System, in cinemas Feb 8!pic.twitter.com/KID1KtA3h3". ↑ Team, The Deadline (February 21, 2014). "Warner Bros Sets 'Lego Movie' Sequel For May 2017". Deadline Hollywood. Retrieved April 14, 2016. ↑ Kroll, Justin (April 20, 2015). "Batman Lego Movie, 'Lego' Sequel Get Release Dates". Variety. Retrieved 4 November 2018. ↑ "The Lego Movie 2 Will Screen Two Weeks Early at Select Theaters". CBR. 24 January 2019. Retrieved 2019-01-26. ↑ Stewart, John (November 19, 2018). "'The LEGO Movie 2' Assembles a new Trailer". Slanted. ↑ Spangler, Todd (November 21, 2018). "'The Lego Movie' Streaming Free on YouTube on Black Friday". Variety. Retrieved 24 November 2018. ↑ "DFS Ties Into "The LEGO Movie 2" With Spot From London Agency krow". SHOOTonline. ↑ D'Alessandro, Anthony; D'Alessandro, Anthony (2019-01-28). "'The Lego Movie 2' Stacks Up $100M Global Promo Campaign, Double The First Movie". Deadline. Retrieved 2019-02-10. ↑ Bell, Karissa. "Chevy built a massive, 3,000-pound Lego replica of its Silverado truck". Mashable. Retrieved 2019-02-10. ↑ "Chiquita partners with The Lego Movie 2". www.freshplaza.com. Retrieved 2019-02-10. ↑ Bui, Hoai-Tran (August 1, 2018). "Everything is Awesome About 'The LEGO Movie 2' Stars Teaching You Airplane Safety in a Turkish Airlines Video". /Film. Retrieved August 5, 2018. ↑ "Christmas Comes To Apocalypseburg in a Lego Movie 2 Short Film". Empire. December 10, 2018. Retrieved 13 December 2018. ↑ The LEGO Movie 2 – Emmet's Holiday Party. Warner Bros. UK – via YouTube. ↑ 'Everything Is Awesome' Dance Together Music Video – THE LEGO MOVIE 2 – Music Video. LEGO – via YouTube. 1 2 D'Alessandro, Anthony (February 10, 2018). "'Lego Movie 2' Comes Apart With $34M+ Opening; 'What Men Want' Solid With $18M+ In Another Blasé B.O. Weekend". Deadline Hollywood. Retrieved February 10, 2019. ↑ Mendelson, Scott (February 11, 2019). "Why 'The LEGO Movie 2' Was Such A Huge Box Office Disappointment". Forbes. Retrieved February 12, 2019. ↑ "The Lego Movie 2: The Second Part (2019)". Rotten Tomatoes. Retrieved February 24, 2019. ↑ "The Lego Movie 2: The Second Part reviews". Metacritic. Retrieved February 8, 2019. ↑ Hassenger, Jesse (January 26, 2019). "The Lego Movie 2 Offers a Second Part with More Songs, Lots of Laughs, and a Little Less Resonance". The A.V. Club. Onion, Inc. Retrieved January 27, 2019. ↑ Machado, Yolanda (January 26, 2019). "The LEGO Movie 2 Film Review: Colorful Sequel Clicks Into New Worlds of Imagination". TheWrap. Retrieved January 27, 2019. ↑ "In 'The Lego Movie 2', everything is still awesome, just a little less so: EW review". EW.com. ↑ Rechtshaffen, Michael (January 26, 2019). "'The Lego Movie 2: The Second Part': Film Review". The Hollywood Reporter. Retrieved January 27, 2019.